Goodbye 2012 and goodbye blog. I said it would happen, and now it’s really here: this is my last post as DIY Dilettante. This doesn’t mean that I’m not busy dreaming up more career ideas–dog musher, website developer, and sunglass designer have all been recent interests–it’s just that I’m too busy trying to make a few of them reality. You may have noticed that, even with some variety of career fields, there have been prevalent themes. Poet, Irish writer, bookseller, novelist–they’re all facets of the same desire to make writing even more central in my life. Between adding a few freelance copywriting gigs, storyboarding my first children’s book, and finishing chapters 2-20 of my novel, 2013 is sure to be a year full of writing. Which is, alas, why I no longer have writing energy left for this blog. I love it dearly, will miss it dearly, and am so glad that some of you have enjoyed it as much as I have. Thank you, thank you, thank you. And Happy New Year. 19,000 people fit into the new Barclays Center to see Jay-Z perform. This blog was viewed about 150,000 times in 2012. If it were a concert at the Barclays Center, it would take about 8 sold-out performances for that many people to see it. I had planned this post a few weeks ago when I started the Minnesota theme, but I must admit it was a bit of a gamble. 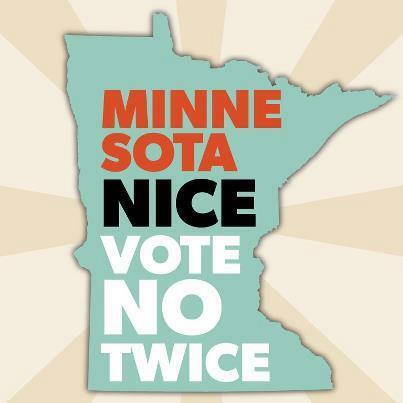 I had no idea whether I would be proud of what Minnesotans would vote for on election day or not. And there was a lot at stake. Now, you might be scratching your head a bit. Minnesota has been in recent political news primarily from Republican presidential candidates Michele “Queen of Rage” Bachmann and Tim “Blandington J. Vanillaman” Pawlenty (and while we’re speaking of nicknames, we also had Jesse “The Body” Ventura as Governor from 1999-2003…oops). But Minnesota also has had the longest blue streak voting for president, due to the distinction of being the only state to vote for homeboy Walter Mondale in 1984. Even though Minnesota was mentioned as a swing state in this election, it never really seemed possible that Romney would win here. 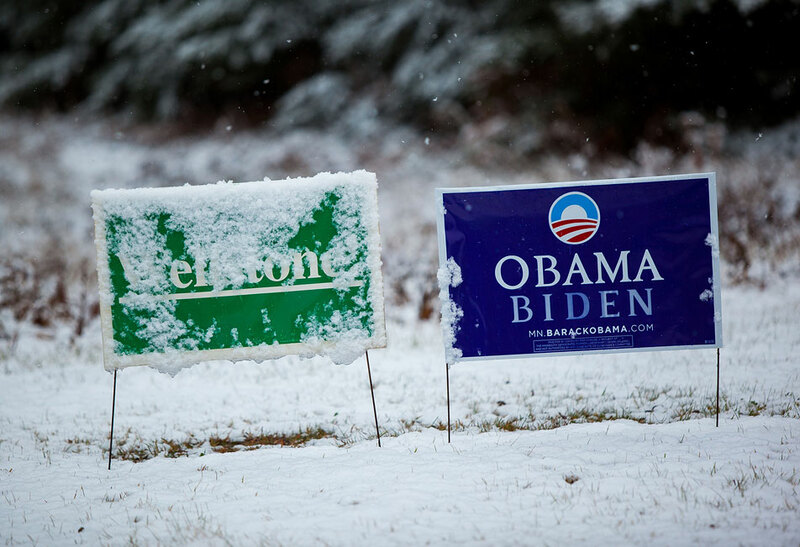 Because in my state, 10 years after the tragic death of our beloved progressive senator, neighbors still put out their green Wellstone signs year after year. Paul Wellstone was elected to the senate in 1990 after being outspent at a 7-1 margin by incumbent Rudy Boschwitz. I was 4 years old then; it was over my high school PA system that his death was announced just 11 days before he would have been reelected to his 3rd term in the senate. So, for most of my childhood, I thought that the job of a politician was to do what Wellstone did: work for peace, healthcare, and the environment. He was an activist for anyone not in a position to otherwise have their voice heard–immigrants, the poor, those with mental illnesses. In short, Wellstone made me naive about politicians. However amazing Wellstone was, he did have his faults. For instance, by 2001, he admitted he’d made a mistake by voting in favor of the Defense of Marriage Act. If Wellstone were alive today, I can only imagine he would have ultimately championed gay rights, recognizing that as the next important battle for equality. Though Wellstone is gone, the ideals of equality and fairness are just as strong with the citizens of Minnesota. This past Tuesday we had two constitutional amendments on the ballot: one to limit marriage to man+woman and one to require ID to vote. That’s not Minnesota nice. So we voted no. Nothing makes me prouder of my state. Unfortunately, Michele Bachmann was reelected by outspending opponent Jim Graves 20-1, but the race was much tighter than anyone would have predicted. The good news is that the Governor, state house of representatives, and state senate are all democratic, so it’s quite possible that gay marriage actually will pass in the next two years here. That would be even more exciting than just shooting down a bigoted amendment. Yeah, I’m pretty proud of Minnesota–there’s a lot to love here. Even Slate says you should move to Minneapolis. Not convinced by my past few posts? Watch Minneapolis mayor RT Rybak and his mom crowd surfing upon the news that Obama was reelected: Checkmate. The Bachelor franchise has an obsession with fairy tale endings. Contestants often speak in fairy tale terms as they describe their dates of dining in castles or swimming with dolphins in the world’s most gorgeous places (actually, they more often speak in ridiculous metaphors such as “Today we jumped off a helicopter together into the ocean, because, you know, love is a leap of faith”). It’s a natural comparison to make because fairy tale endings are romantic, simplistic, and, oh, they don’t last. On Saturday night I went to a brilliant performance of Into the Woods, the Stephen Sondheim musical that follows Cinderella, Little Red Riding Hood, Jack of Beanstalk fame, and Rapunzel to their happily ever afters…and beyond. For the initiate, intermission is confusing since the characters have each already accomplished all they set out to do–what more do we need to see? In the second half, though, we find out that while Cinderella has stopped running, her prince hasn’t given up chasing. Jack slew a giant, but now the giant’s wife is hungry for vengeance. And characters start dying. After a frivolous first half, the second half is surprisingly sobering. Which is like that time I watched the non-Disney version of The Little Mermaid and found out the original Ariel committed suicide to spare her beloved prince. Ouch. 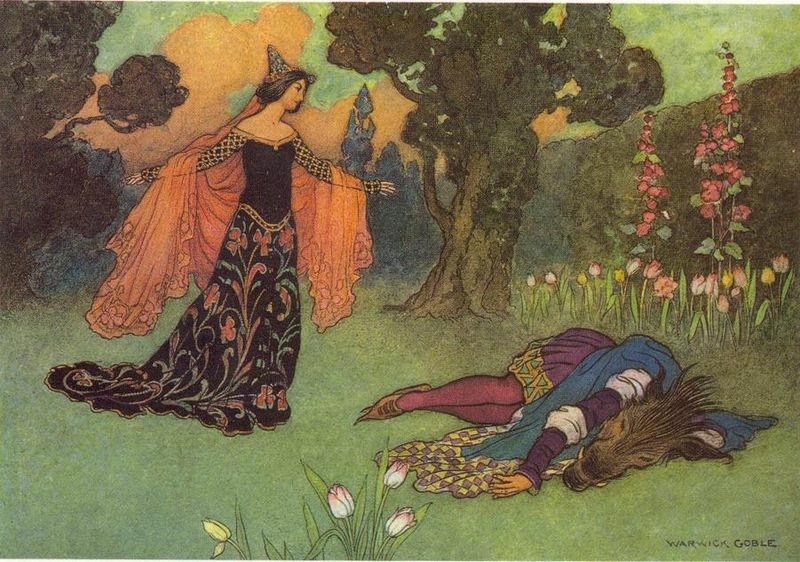 Fairy tales are not particularly happy places to live in. Sure, a lot of the Grimm Brothers’ tales end in marriage, but first there are deals with the devil, murders, severing of limbs, and disowning of family members. In one particularly gruesome story, a stepmother feeds her stepson to her husband so that her daughter may be the only heir. And then, of course, a magical bird drops a millstone on the evil stepmother and the son is returned to the father, happy and whole. Moral of the story: don’t try to live in a fairy tale unless you’re really good at communicating with birds. Emily Maynard, start working on your songs. Yesterday my boyfriend and I went to the Minneapolis Institute of Arts for a family-friendly event called ¡España! I had been lured by the promise of flamenco guitar in the galleries. Since I was fairly sure I would know the guitarist(s)–the Twin Cities flamenco community is not all that big–I was more interested in the concept of looking at art with flamenco guitar as a backdrop than the music itself. After wandering around the galleries waiting to hear guitar strings vibrating in the vicinity, we finally just asked a docent where to find the guitarist. He pointed back the way we came: all the way to the end of the hall, take a left, and all the way to the end of that hall. We wound up in a bright white atrium–no art on the walls–facing an empty black chair with a microphone forlornly angled at the floor and a sign saying “Flamenco guitar: 12 pm-4pm.” I looked at my watch: 3:15 pm. The day was not a total waste, though, because I always love wandering the Institute’s halls. We walked past old favorites–the easy to love Monet haystack and Van Gogh olive trees, the more violent Max Beckmann triptych that my mom and I discovered last April–and temporary galleries of photography and modern art. It wasn’t always like this. When I was a kid and it was one of my parents’ birthdays or we had a visitor from out-of-town, we would invariably go to the MIA. I was not bored by the art at the time, but I always assumed beforehand that I would be; this assumption, voiced in protest to my parents, meant that I could not thereafter be seen enjoying myself at the art museum. Perhaps it was when I visited London with my mom at the age of 14 that I suddenly realized how much I do enjoy being at art museums. 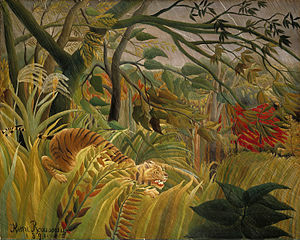 We went to the National Gallery and I fell in love with two paintings there: Henri Rousseau’s Tiger in a Tropical Storm and The Execution of Lady Jane Grey by Paul Delaroche. 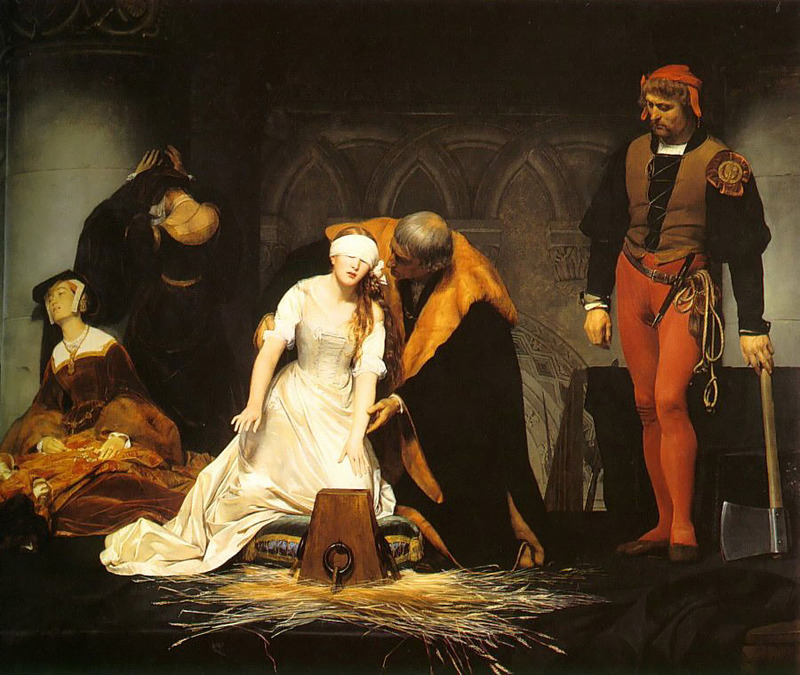 Because they were the first paintings I truly loved, they are still the paintings I love best. And while I haven’t fallen quite so hard for any other painting, I have been strongly affected many times since while touring art museums: at Madrid’s Reina Sofia I stood shocked at Picasso’s Guernica and felt intensely nostalgic in front Dali’s Muchacha de Espalda. 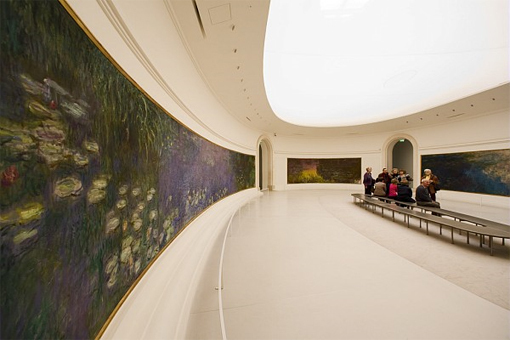 I felt awed by the gigantic water lily paintings that wrap around two ovular galleries in the Musee L’Orangerie in Paris. And I was giddy with excitement seeing Van Gogh’s Starry Night in person at the MoMA. The best experience I had, though, was a thirty-minute jaunt through the Louvre on a Friday evening with my friend Hilary. Admission was free for those under 26 on Friday evenings, and we’d meant to get there earlier but had dallied. This also happened to be a night where musicians were scattered around the vast palaces. Hilary and I raced past a jazz trio playing in front of an Egyptian pyramid, a violinist in the Great Hall, a brass quartet by the Venus de Milo. It was this beautiful phantasmagoria of color and sound made more exciting by the fact that we were actually, literally, running through the Louvre to take it all in. What I can’t fathom is how incredible it would be to work in these buildings, to patrol the corridors where incredible art hangs, to have meetings down the hall from John Singer Sargent or El Greco or Caravaggio. Does a curator become complacent about the scenery? It seems doubtful. I imagine that being in that setting day after day would be like a perpetual dream…flamenco guitar or not. 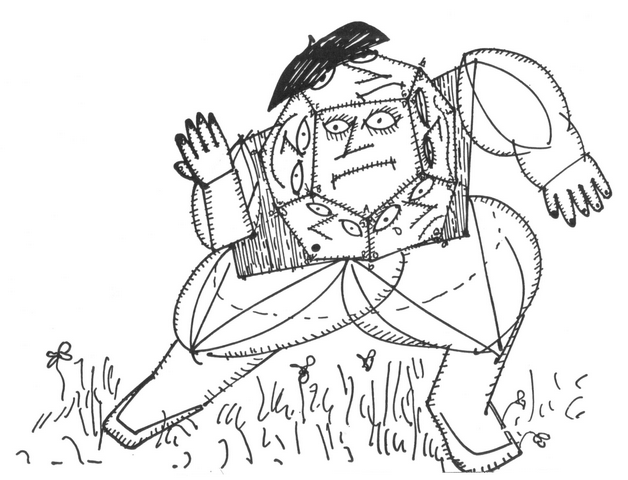 So says the .58 child in Norton Juster’s masterpiece children’s book The Phantom Tollbooth (the child is part of an average family with a mother, father, and 2.58 children–he’s the fractional son). I’ve written about The Phantom Tollbooth before because it’s so full of wonderfully odd explanations of concepts. Milo, the main character, and his retinue make it to Digitoplis where numbers are mined and sent around the world (though they are highly valuable it’s alright when a few numbers drop to the ground because the broken ones can be used for fractions). They also eat subtraction stew–the more you eat, the hungrier you get. When Milo asks to see the biggest number in the kingdom, he is shown an extremely large 3–it took 4 miners to dig it out. He tries to explain that he wants to see the number of greatest magnitude. The Mathmagician (ruler of the land of Digitopolis) tells him to think of the biggest number possible, and then add one. And then add one again. “But when can I stop?” pleaded Milo. Sometimes I wonder if reading The Phantom Tollbooth at a young age gave me a head start on my math career. Thank you, Milo.